The sun’s radiation can also reflect off water, snow, and white sand. Snow reflects 85% of UV radiation. One of the most important ways to prevent skin cancer is to use sunscreen. Sunscreens with a sun protection factor (SPF) of 15 are commonly recommended, but in places like Santa Fe, New Mexico, one should really use a minimum of SPF30 or even higher. At higher altitudes, a thinner atmosphere filters less UV radiation. It is estimated that for every 1000 feet in elevation gain, there is 4-5% more UV radiation. That means that in Santa Fe, there is exposure to approximately 30% more UV radiation than near sea level at the same latitude (e.g. Little Rock, Arkansas). You should use plenty of sunscreen and rub it in well. Sunscreen should be applied 30 minutes before going into the sun, and reapplied every two hours or every hour if you are sweating or swimming. Be sure to cover any areas of the body exposed to the sun including your ears, the back of your neck, and any bald areas on the top of the head. 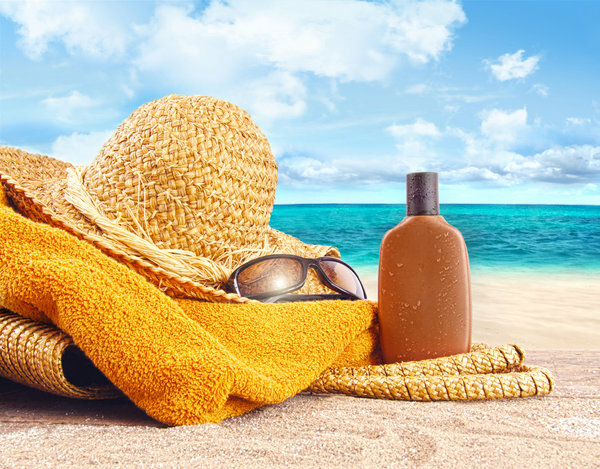 Sunscreen that blocks both UVA and UVB radiation should be chosen. It is also important to wear a wide-brimmed hat, sunglasses, and protective clothing. A hat with a 6 inch brim all around is the best. Wear sunglasses that block both UVA and UVB rays. Sun exposure also increases your risk of getting cataracts. Wear protective clothing, such as long-sleeved shirts and long pants made of tightly-woven fabric. Special sun-protective clothes are available from several companies. Remember, you are often exposed to the sun while driving, especially your arms and hands. Don’t try to get a tan. Don’t use tanning salons or sun lamps. Tanning booths and sun lamps damage your skin just like real sunlight does. What else can we do? The earlier skin cancer is found, the more likely that it can be cured. Look for new or changing spots on your skin. See your doctor if you notice anything changing, itching, or bleeding. What about children? Sunburns in childhood are the most damaging. Children younger than 6 months of age should never be outside in direct sunlight. Children over the age of 6 months should wear sunscreen every day.